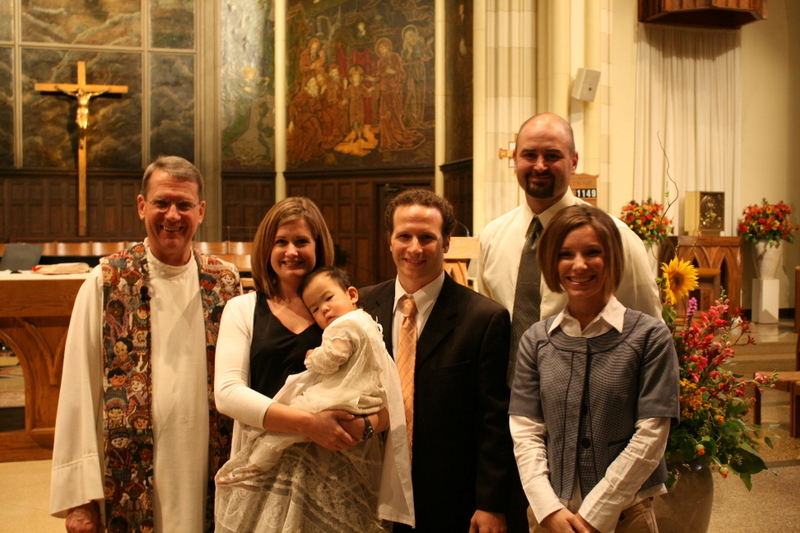 Poppy's baptism was on Sunday and everything went really well. 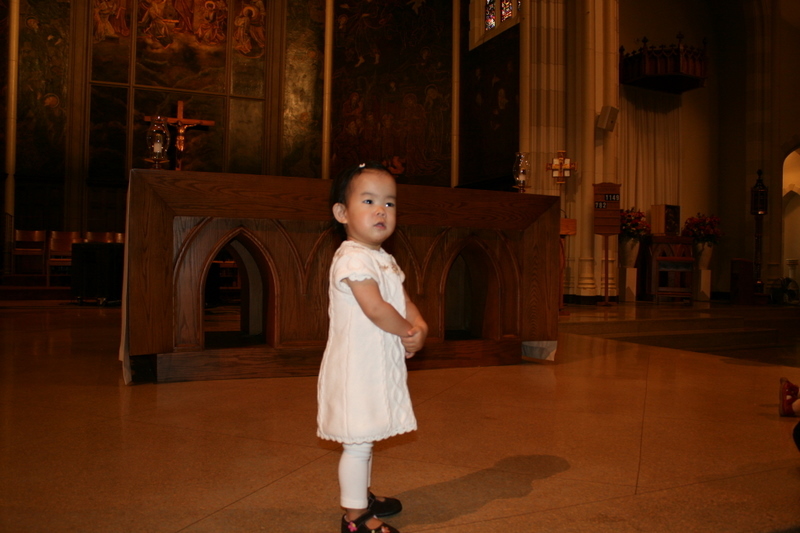 She was great during the unusually long mass before the baptism and although she didn't seem to appreciate having water poured over her head (see picture below), she did great for the baptism too. 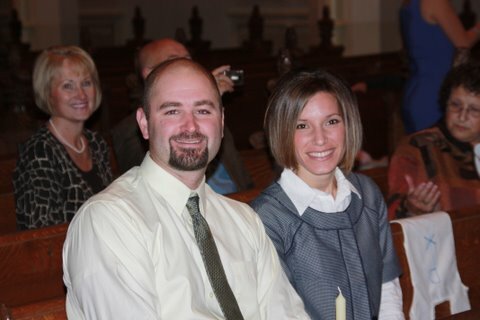 For the ceremony, she wore my family's christening gown that was made from my great-grandmother's wedding dress, as well as a garment Marc wore during his baptism. 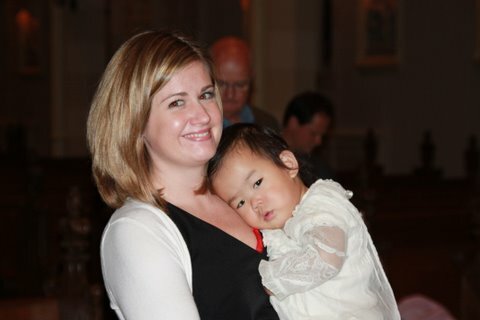 There was one other baby being baptized at the same time and her name was Lola. 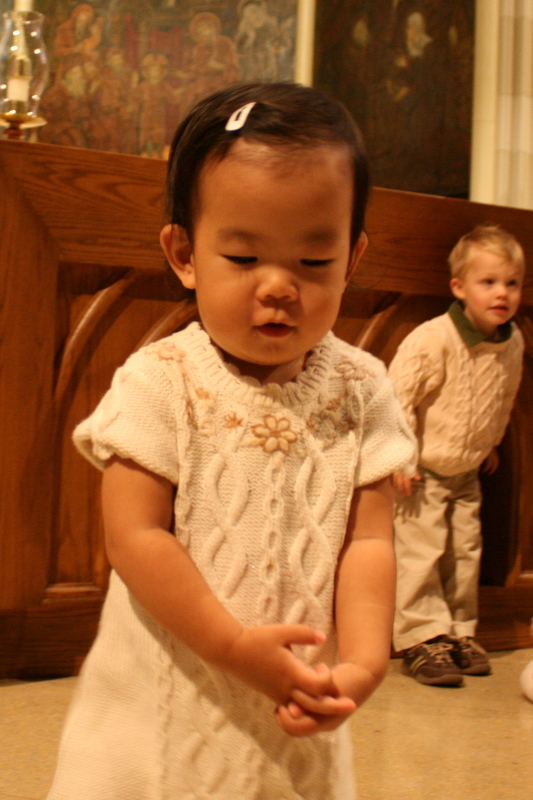 So the priest kept addressing "Poppy and Lola", which made everyone on our side of the church giggle each time. 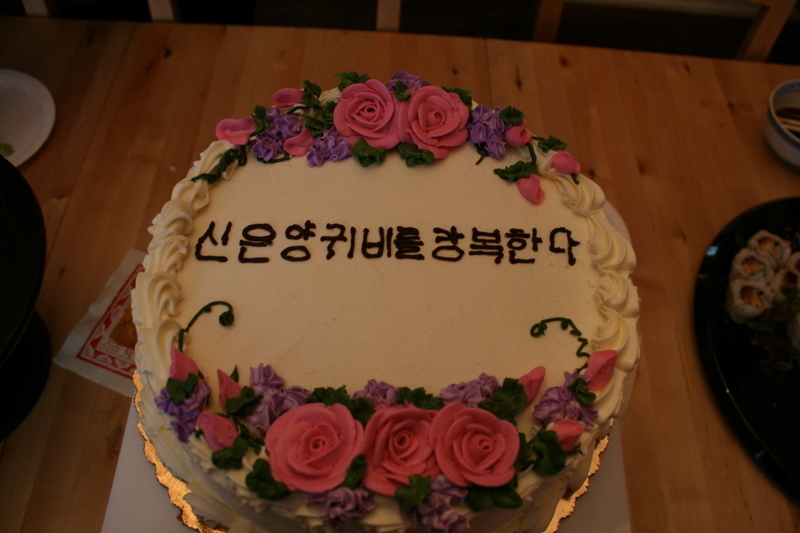 After church, everyone came over for a "Korean" celebration. We served our favorite Korean dishes; kimbap (korean sushi), chicken bulgogi, jap chae (noodles), fish cakes and kimchee. 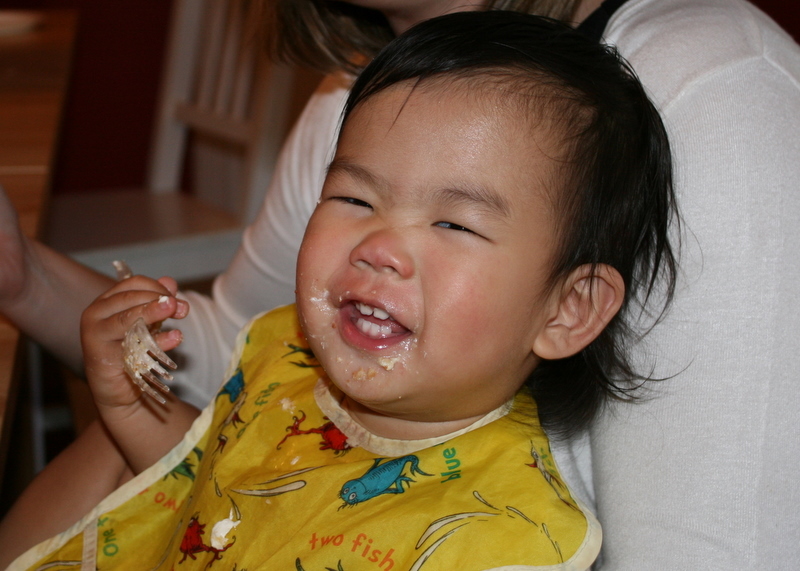 It was everyone's first time having Korean food and it seemed like just about everyone liked it. We tried to keep the party as small as possible so that Poppy wouldn't be too overwhelmed, but apparently it was inevitable. The fact that she didn't sleep well the night before and then the baptism was during her nap-time didn't help put her in the greatest of moods. So for most of the afternoon she clung to my chest and looked at everyone like, "why are you eating my fish cakes? why are you playing with my toys? why are eating my cake? when are you all going to leave?". So many things....where to start?! Ok first off, the dress in the first picture...ADORABLE!!! Secondly, I got a little teary...I can't believe how big she is getting!!!!!!!!!!! The cake...adorable - did you do the writing? The family gown...great. You....look fabulous - super cute hair! Congratulations!!!!!!! congrats to Poppy. What a great day for y'all. She looks so adorable in her knitted dress. Love the last photo! Great job to whomever did the writing on the cake. Oh, so sweet! The cake looks awesome!! First off, your hair looks terrific. Secondly, the last pic of Poppy is my favorite. The others were adorable but she looks the happiest just chillin' and eating her cake. What a special day for You, Marc and Poppy as a family! She looks very adorable. Hope to talk to you soon. How awesome. I love the dress...the cake...it all looked perfect!